Trade65 was created in 2013, so it is one of the ‘younger’ binary options brokers out there. Their age shouldn’t fool anyone, however, because a quick look at their website and trading platform will tell you all you need to know about Trade65. Their homepage is designed immaculately; their binary options trading features are easily some of the best that you’ll find on the market, and their trading academy contains enough enriching material to turn a beginner into an advanced trader. The Standard Level 1 Trade65 account is ideal for beginners who just want to deposit as little as $200. The deposit is matched by a 20% bonus and includes a market review as well as an eBook. The 2nd Level Standard Trade65 account involves a $500 deposit which is matched by a 25% bonus. The account comes with the same features as the Level 1 account with the addition of binary options trading signals, and a dedicated account manager. The 3rd Level Standard Trade65 account comes at a deposit of $1000, with a 30% bonus being the only thing differentiating it with the 2nd Level account. The Business Level 1 Trade65 account is available for a $3,000 deposit. Traders receive a 40% bonus, a demo account for 1 week, an account manager, and one session with a Trade65 analyst. For a $5,000 deposit, binary options traders have access to the 2nd Level Business Trade65 account which includes a 50% deposit bonus, an options trading plan, demo account access for two weeks, and four sessions with an analyst. The 3rd Level Business Trade65 account type is for traders who deposit at least $7,000. This account type comes with the same perks as the other packages with the exception of a 60% deposit, a demo account for a total of three weeks, and 8 sessions with a Trade65 analyst. Level 1 VIP Trade65 account subscribers get the advantages of all the aforementioned account types and then some. The $10,000 deposit comes with a 70% bonus, a money-management and 60-second binary options strategy, one month of demo account access, VIP broker, 16 sessions with an analyst, access to a VIP Account executive for one week, and one session with a financial advisor. The 2nd Level VIP Trade65 account comes with a $25,000 price tag, and Trade65 matches that with an 80% bonus, a free iPad, three months access to a demo account, a total of 32 sessions with an expert analyst, two-week contact with a VIP account executive, and two sessions with a financial advisor. The 3rd Level VIP Trade65 account is for advanced traders who wish to make a $50,000 deposit. It comes with all of the features included in other accounts, with the addition of a generous 90% deposit bonus, a demo account for six months, a free Macbook Air, indefinite sessions with an analyst, one-month contact with a VIP Account executive, as well as three educational and informative sessions with a financial advisor. The Infinite VIP Trade65 account is the heftiest Trade65 account type. Trade65 sees your deposit and calls it with a 100% bonus, a time-unlimited demo account, a Macbook Pro on the house, unrestricted VIP Broker access, unlimited analyst access, two-month sessions with a VIP Account executive, and infinite sessions with a financial advisor. The Trade65 trading platform has many exciting features for all traders, beginners and expert alike. Firstly, the Trade65 trading platform is exclusively web-based and also runs on iOS and Android devices, which is a huge advantage considering most traders prefer trading on-the-go. The Trade65 trading platform is extremely easy to use and does not contain any superfluous clutter like many binary options trading platforms do. 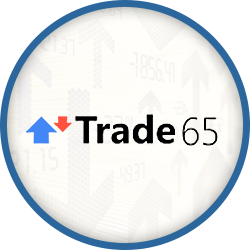 Trade65 users can use the Trade65 trading platform trade currencies, commodities, stocks and indices on a number of option tools like the classic High/Low options and 60-second options. Traders even have access to the StrategiX feature on the Trade65 trading platform, through which they can benefit from payouts of up to 318%. The site contains a large array of educational resources made up of a glossary, webinars, eBooks, market reviews, market analysis tools, and other eLearning features which come in handy on the Trade65 trading platform. Trade65 users can contact the broker’s customer service representatives around the clock, through live chat, email, and telephone, in the following languages: English, Arabic, Spanish, French, German, Russian, Chinese, Japanese, Korean, Portuguese, Swedish, and Hungarian. Trade65 moreover offers remote support assistance in case of any technical issue. www.trade65.com deserves to be nominated among the world’s top binary options brokers. They take trading seriously and have delivered on every front. Users who trade with Trade65 can’t help but be satisfied with what this broker offers in terms of reliability, transparency, educational tools, and trading features found on the Trade65 trading platform.